It all started in L.A. I was driving back to the Hollywood area, up along La Brea, North of the hood when I saw a sign written on a piece of box cardboard and pinned to a light pole: “Lucha Libre los Domingos”. Or something like that. I was an archive librarian at the L.A. Times and all I wanted to do at that point was get my words up in them pages. Besides my moms (HI, MOM! ), I’d been inspired and prodded by Samantha Bonar, Daniel Hernandez and Chris Lee, folks I’ve worked with who have been hyper successful with the written word. At the time, “Nacho Libre,” the Jack Black movie based on an actual wrestling priest had just come out and I knew I could sell a pitch based on the idea of lucha libre in the city. The lucha libre event in an old warehouse in South Central Los Angeles was a regular venue in 2006. I walked in, flashed my press creds and took a seat near a small family who had bought a bunch of pig skins, beer and hotdogs. I don’t remember every particular match. I remember there was a gay wrestler, a fat wrestler and someone with a costume on, either a panda or a pig or something strange. What I do remember is Mil Mascaras. The legend, the O.G. of a thousand masks. He was there. We spoke. I was a little skeptical, wondering if the guy under the mask was the legend. I looked at this arms, they were the wrinkled, aged arms of a man in his 60s. I glanced up at this chest. It had that barrel shape you only get from decades of pumping iron, his arms had the same sinewy look to them. The dude was old, but he was probably rock solid. I didn’t bother touching him. A Japanese looking man, who didn’t speak English thrust a mask in Mascaras’ face as he left the ring, “Please sign.” The legend obliged. I was shocked that this Japanese dude came all the way down to the hood just to fulfill his fandom. As it goes the Japanese love professional wrestling. Outside of Mexico, Japan must be the biggest non-U.S. market for American wrestlers, and their Mexican lucha libre counterparts. I’m not a wrestling fiend, but I enjoy the choreographed ballet that ensues when two athletes get into a ring and do choreographed stuntage to the glee of kids and grandmas. It’s still a spectacle that in some parts of the country is less expensive than a night at a cineplex. And more enjoyable in my opinion. I used my appreciation for wrestling to graduate journalism school. I haven’t graduated yet, but my Master’s Project got some good notice and that’s a major part of getting your Master of Science degree here at the “journalism school of eternal excellence,” a.k.a the House that Pulitzer built. At a celebration in September, where all of New York City’s Mexican population gathered for the bicentennial of the countries independence I saw a postcard advertisement on the ground. Lucha libre it said in the style of promotion similar to what I saw in Mexico City when I was there. A full card, about 8 bouts. This had to be new stuff here in NYC. I’d never heard of such a thing. How new it was, I’m still now sure. People other than Lucha Va Voom have tried before to stake a claim in NYC even if it was for a show that was passing through. My aim was to tell the story of a guy who was trying to get this off the ground and the wrestlers he was bringing along for the ride. 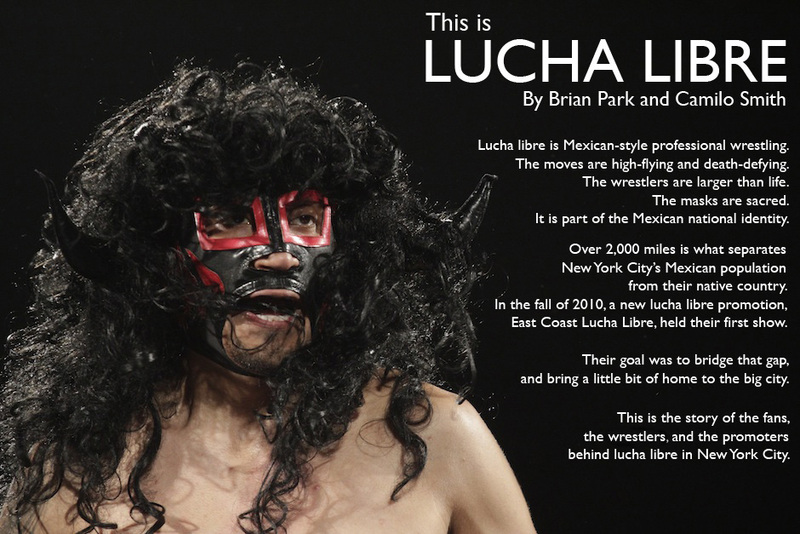 I think I succeeded in getting this noticed by a few folks around the world, but the project luchalibrenyc.com is still a work in progress. My L.A. homie @thebrianpark is a huge part of this project and I couldn’t have done it without him. His fearless shooting style and dedication to helping to round out this story really produced some solid work, with more to come. So, if you’re a fan of lucha libre, or just like to see shirtless men through each other around, come back often because I’ll be updated luchalibrenyc.com and posting link on this blog.